How Do You Get a Custom Vanity URL on Vine? It’s an age old question, as old as Vine itself. 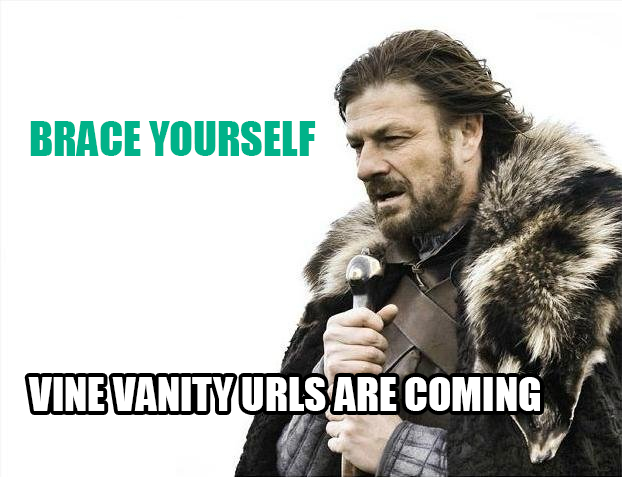 People have been clambering to get their unique vanity URL on Vine for some time now. Well, Christmas is coming a little early (even earlier if your Twitter Account has already been verified). 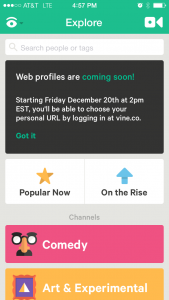 Vine will start letting individuals claim their own URL on Friday, December 20th, 2014 at 2PM EST. The public service announcement was built into the iPhone app. We’ve attached a screen grab for your benefit. The instructions are simply to log into your account at vine.co at the aforementioned time. Other sources indicate that only Twitter verified accounts will have access at first, and then the rest of the un-verified profiles can follow suite three days later on December 23rd. If you manage brands for several clients, we apologize that your holiday vacation has had a wrench thrown in it! Hopefully, like us, you won’t be working too hard on Christmas Eve Eve. We’re excited about what this change could mean for Vine in 2014. Obviously, the service could become more “present” (forgive the pun) on the web. What, did you think Xbox Ones and PS4s were going to be the only Holiday Land Grabs this season? You know nothing sweet summer child! Well, that a “wrap.” Sigh. We’re sorry. That’s the last pun, we promise. If you like getting poignant time-sensitive information like this, we suggest you sign up for our newsletter. You can do so below! Happy Holidays!